Looking for a non-leaching, non-toxic, durable alternative to plastic for storing snacks on the go? Stainless steel snack containers are a great reusable, eco-friendly option - and for kids, colourful designs are best. Let's face it, stainless steel anything is an investment. There are no concerns about toxins leaching into your food and yes, they'll probably outlast us all but they're also more costly than disposable plastic options. Don't get us wrong, without a doubt the investment is worth it in savings in the long run, but to help ensure your stainless steel containers last for the long run - without getting lost at school - we suggest choosing fun, colourful designs that make kids want to hold on to them. 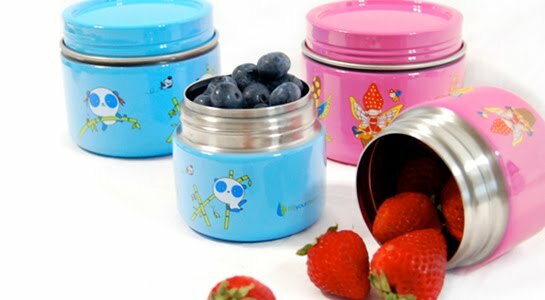 Our Blue Panda Stainless Steel Snack Containers Set and our pretty Pink Fairy Tea Party Snack Set both include two containers of different sizes: one 8oz. and one 16oz. container. They're perfect for all kinds of snacks and the screw on lid combined with the silicone seal (you get an extra one of these with each container) means these snack containers are leak proof and airtight. They're so airtight, the manufacturer recommends them for storing loose leaf tea and spices too! THIS GIVEAWAY IS NOW CLOSED. THE WINNER IS SOOZLE! THANKS TO EVERYONE WHO ENTERED. We have one pink fairy stainless steel 8oz. snack container to give away. Tell us in a comment below what you would pack in it and it could be yours! Please be sure to include your email address so we can contact you if you win. This is our Friday Freebie, but we're happy to take entries through the weekend. Deadline for entries is midnight PST Sunday, May 29th and we'll announce the randomly chosen winner on our blog and on Facebook Monday, May 30th. Good luck! I would put grapes in mine for my daughter! I would pack some goldfish crackers or a fruit cup. I would put blueberries and raspberries from the garden in the container! i would put crackers in it for my daughter..
i would pack a fresh fruit salsa in it! Trail mix or dried fruit would be perfect in it. I'd pack home made fruit salad in it! My baby girl has started to eat solids now so I would put different fruits and veggies for her to enjoy in the near future. Since she doesn't have a container of her own this would be great!!! I'd put our "new favourite" snack - cut up strawberries!!! My daughters would LOVE this!!! Sooo cute!! extra entry for some Facebook love! I would put all sorts of fruit, nuts, things like that. Perfect for my daughter! What a fab idea! It looks perfect to hold yogurt, fruit & granola...or fresh snap peas, carrots and peppers. Yum! I have 3 girls. On a daily basis they take yogurt, goldfish crackers, small fruits or apple sauce. So one of those would be in there. Id love these..so prettyid pack gold fish and cheese cubes in mine! My daughter currently loves peaches and mandarins for her lunch - would be perfect size for her portion. I would pack some fresh raspberries in my container! fruit, crackers, cereal or cheese cubes. i would make a fresh fruit and veggie salad for the girls to snack on in between therapys. i would use it for fresh watermelon chunks! yum! I would put fruit like grapes, blueberries and strawberries in mine! and I like your facebook! i would put grapes or cut-up strawberries in it! I would put my salad dressing in it for work. Like you on your Lavish & Lime Facebook Page. Charlene V.
I would put salsa in it! I would put goldfish crackers or dried mangoes. I would fill it with green grapes! I would pack fresh raspberries! I'd put my daughter's favorite fruits and cereals. I would pack fresh juicy fruit for my son to enjoy! I would put applesauce in ours (a current favourite).